Lest anyone think that Friday’s chilly weather conditions also chilled the mood inside the Knapp Center at Drake University, or that this event might have seemed somehow anticlimactic in the wake of the big one we reported on in January, read on. 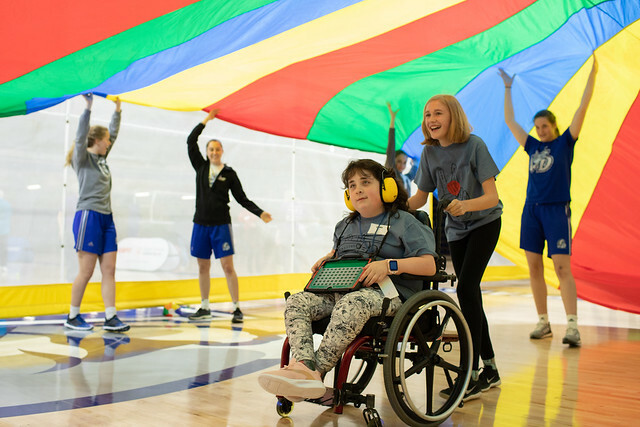 The 2nd annual DMPS Middle School Unified Sports Day was bigger and better than last year’s, poorer weather notwithstanding. The “Inclusion Revolution,” one that’s about joined forces; not opposing ones, rages on! Before the festivities got underway were the opening ceremonies that included jokes and juggling; songs and speeches. Robert Thacker, a 7th grader from Hiatt Middle School, cheerfully implored hundreds of his peers from other schools to get to know one another. “Today we are all part of this revolution,” he said, before leading everyone in the Special Olympic pledge: Let me win. But if I cannot win, let me be brave in the attempt. Eighth grader Tobby Givler from McCombs echoed Robert’s remarks and reminded everyone to exchange plenty of high-fives, advice that was freely followed throughout the day. Joy Rector and Evie Sly were there, the pair of mascots for the movement we reported on before a big adventure they shared over Spring Break. “We met students from 39 different countries on our trip,” said Evie. A year ago, Joy delivered some of the opening remarks at the first Unified Sports Day. Since then, she’s traveled all the way to Abu Dhabi, spreading the revolutionary message of inclusion. Back home, the revolutionaries have been busy fighting their good fight. And they’re STILL not done. Because the one at Drake University isn’t big enough for the both of them!